Do you fear that the game might encourage aggressive behavior or bring the beast out of your canine, resulting in control issues? Well, that’s a legitimate concern and as much it should be carefully taken into consideration, the truth is there’s a lot you should also consider in addition that. As you will realize later, there’s much to be gained from this game if you do it right. You might not know this but the game even has a special day dedicated to it. The 19th of February is the international day of doggie tug of war, meaning this activity must be special to dogs and their parents for it to be accorded such an honor. Nevertheless, caution should be exercised and rules of engagement established before playing it with your mutt. 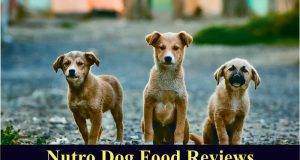 In this article, I’ll unravel genuine fears by doggie parents about tug of war toys, the immense benefits that playing such a game can bring to your dog, and review in detail what I found to be the best tug toys for dogs. 2 Why Play Tug Of War With Your Dog? Why Play Tug Of War With Your Dog? Even though most dogs will naturally love this game, there are those few unique ones who are the odd egg in the basket that might not. If your little friend doesn’t seem to enjoy it or refuses to play it, try another activity or toy that she might like. That aside, the fact that your dog can have a mean aggressive streak when excited is one of the major reasons to play tug of war with her. This game no doubt does bring out a bit of aggression in your pup but it also offers a great opportunity in exercising control over her when she gets too excited. It teaches her to stay controlled and to calm down quickly after excitement. Another benefit and a reason why you should play tug of war with your pooch is to help her exercise her teeth and jaw muscles. This should be done with moderate strength when tugging with her in order not to cause injury. It’s also worth mentioning how the toys can help floss your dog’s teeth. Imagine your little friend ending up with better dental hygiene just by virtue of playing some tug of war. These are all good reasons to introduce the game to your pooch through the help of a tug of war toy. However, it should be noted that some general rules of engagement should be applied between you and your pooch for the game to be beneficial. Once your pooch has the toy and is tugging for a while, when you ask her to let it go, she should obey. If she does, give her a treat and allow a pause of, say, a half a minute, and ask her to take the tug dog toy again. After some training, you will notice that although the game does stimulate her, she still remains obedient. With time, you will not need a dog treat to get her to let go of the toy should you command it. Contrary to what most doggie parents might think, a tug toy does not foster aggression in your dog. This toy is about control, excitement, obedience, and a stimulating bonding time between you and your canine pal. Not all dog tug toys are made equal. 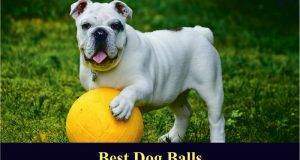 You might have been through a dozen already as your dog successfully makes short work of them by yanking and ripping them apart during your tug of war sessions. You will definitely come across plenty of dog tug toys out there, but very few can actually withstand the sort of punishment that you and your pooch are about to inflict on them. So when buying one, it is good to pay attention to some features so that you can have a better chance of making a good purchase. Top on the list is the material(s) used in constructing the tug toy. 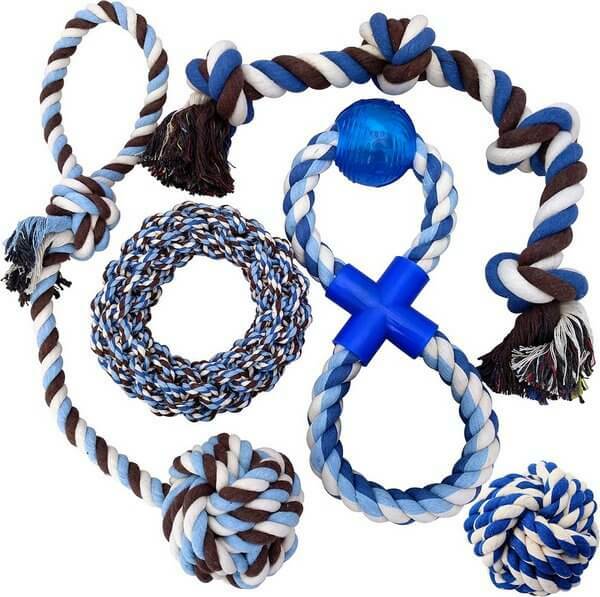 Reliable tug toys for dogs are made from materials such as leather, french linen, tough rubber, and natural rope. Such materials feel soft to the touch yet are incredibly tough to break through or even tear with your own strength. Also, given that your pooch will be putting this material in her mouth and sinking teeth into it while tugging, it is important they be toxin free. A tug toy may have a handle or not. When it comes to handles on this toy, it’s a matter of preference because they are to your benefit and your pooch couldn’t care less what handles you opt for or if you opt for any at all. The whole reason most dog tug toys come loose or simply rip during playtime is because of flimsy stitching. So, check and pay close attention to the toy’s kind of stitching. Heavy-duty cotton stitching is the best. Edges and handles are most vulnerable to ripping. You should, therefore, examine them to see if they have double-stitching or even triple-stitching to ensure durability. 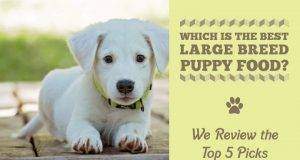 Since dogs come in different sizes, you should take this into consideration just to be sure the toy that you purchase will be suited to your dog’s physical size and bite strength. As promised earlier, here’s what I found to be the best tug toys for dogs. 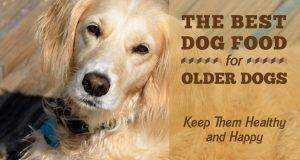 In addition to being crafted for longevity, these toys are absolutely safe for use with your canine buddy. For dogs that totally love playing tug of war, the Mammoth cottonblend will work pretty well for them as it’s gentle yet tough enough to sustain active play. Five knots on the rope means there are plenty of places for your dog to grip. The rope is genuinely tough because of the top-grade natural cotton it is constructed from. You can be sure that it won’t break on your first tugging episode with your canine buddy, which also implies you are going to have it around for a relatively long time. Not only will your pooch enjoy a good jaw and teeth work out from play tug of war, but the rope can also double up as a fetch toy when you need to break the monotony of play. Expect the cotton rope to be gentle on her teeth. Besides, it works as an effective chew toy for teething puppies because it’s tough yet gentle on the gums. 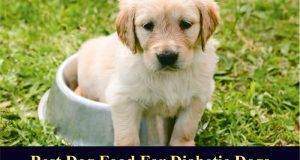 Adult doggies get a thorough dental floss just by chewing on it. 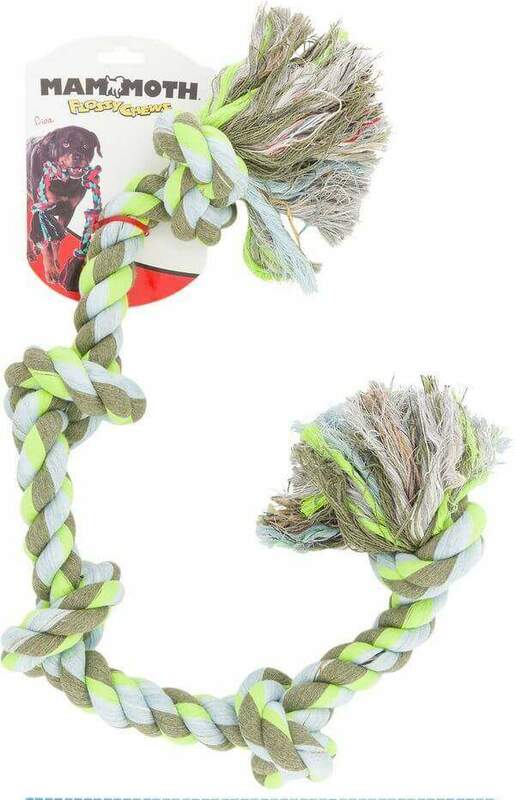 On the whole, this toy makes a great tug toy as it is one of the strongest rope toy for dogs you can hope to find around. You can place your order for this superior toy on chewy.com. Otterly Pets Rope Dog Toys come as a set of 5, each with a different design. The variety has been most welcome by pet parents, most admitting that their dogs seem to love it when they have an assortment of unique toys to play with. Despite the different designs, the toys have one thing in common: They all are great for tugging, which helps build teeth strength while at the same time providing a good jaw workout. All of the above are made from non-toxic cotton, which is both tough and 100% washable. In addition, these toys are strong and durable for tugging. They also help with massaging gums and flossing in your dog’s teeth. Although tough, they sure are not indestructible and may not survive the assault of very aggressive chewers. The variety, however, is unbeatable. You can get this set from leading online outlets such as chewy.com. The Zogoflex has a unique S-shaped design and it is quite flexible with the ability to stretch up to twice its length. It makes for an engaging session of tug of war with your pup owing to its stretchy feature while still remaining gentle on her teeth and gums. The Zogoflex is exactly what you need for a day out in the park as it also works well as a fetch toy. The bright colors that it comes in make it easy to spot in case it lands in the shrubs, water, or snow. You can also feel free to toss it in the water because it can float just fine. I am sure your dog will be more than happy to get her feet wet and faithfully fetch. What’s more, this tug toy has a decent bounce, adding a twist to your toss and fetch. 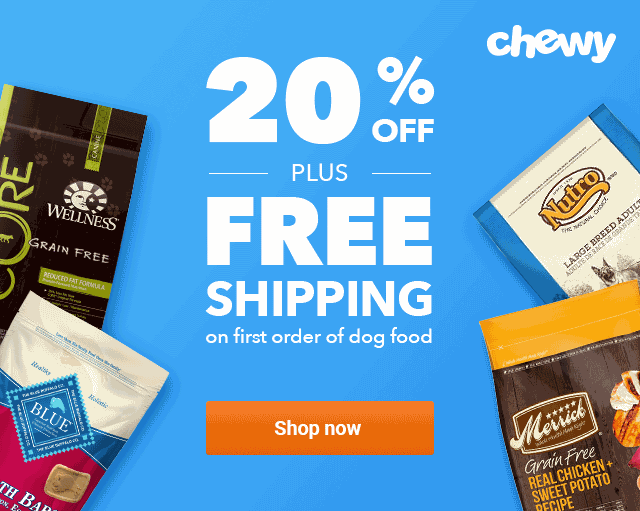 Your dogs will love the chewy feel of this toy and you will often see them thoroughly engaged in chew sessions as they get acquainted with their new found friend. If you would love to get your dog one, Zogoflex Bumi Dog Toy is available at chewy.com. A happy pooch is one that gets plenty of play time by way of activities that stimulate their doggy nature and nothing quite does it like a toy rope that your furry buddy can chew and tug at with you. This Bones & Chews Cotton Toy Rope is tough enough to withstand your dog’s good-natured aggression and chomping. What I found special about this tug toy is that it introduces an interesting element to play with the addition of bones on the rope. This is pretty cool because dogs already love their rope toys, and the bones enhance the engagement level and interaction between your pooch and this toy. For those doggie parents who might be worried over the possibility of the bones splintering, you can rest easy because the bones are 100% made in the USA and undergo a roasting process that reduces splintering by allowing the bone to maintain moisture. What’s more, this tug toy is made from 100% cotton and contains no preservatives or harmful chemicals. 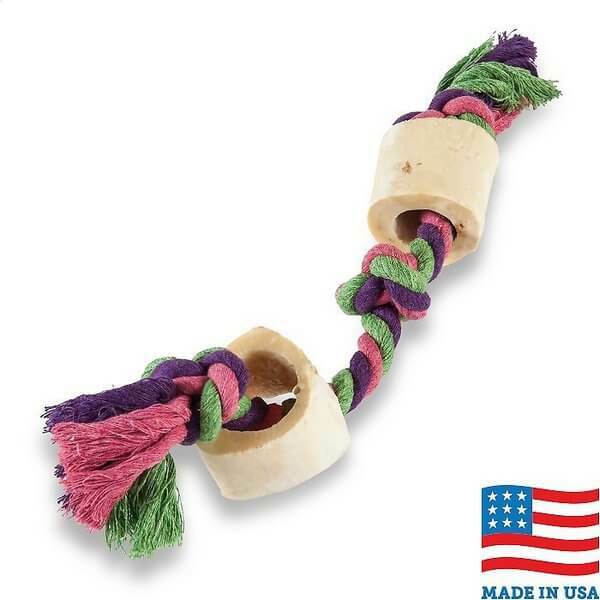 If you would like to purchase USA Bones & Chews Cotton Rope with Bones Dog Toy for the best price, look no further than chewy.com. Kong has great handles for you to hold and pull on one end while your furry buddy clamps down her teeth on the other end and tries to show you who’s the boss. Even if tugging doesn’t come naturally to her, this is the toy you may not want to pass on. Kong Tug Dog Toy assumes that your pooch is wired to tug and so, it provides you an opportunity to actively bond with her over interactive tugging sessions. Like the other quality toys we’ve looked at, the Kong Dog Tug Toy is constructed from natural rubber, which provides the right balance between tough and soft. This means that although your pooch is likely to give the toy a tough chew, the Kong can take it. Also, Kong begs to differ on the claim that tug of war with your pooch encourages aggression because your dog’s ancestors used to do naturally while feeding with their fellow packmates. The only thing is to make sure that the tugging play is measured and controlled while using this toy. 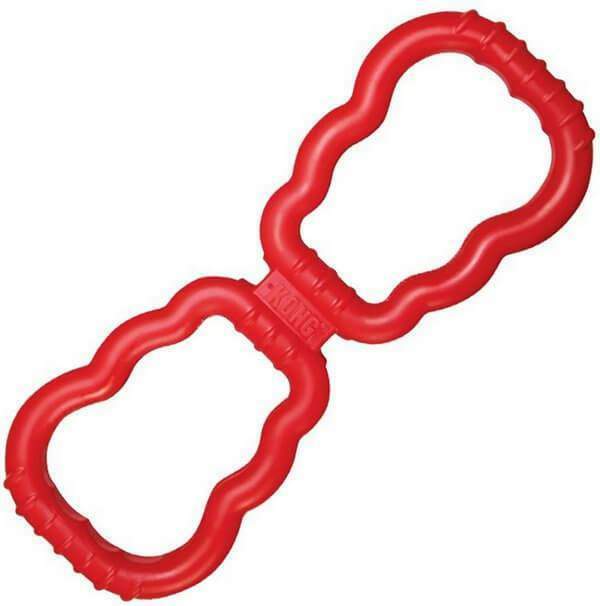 Kong Tug Dog Toy can be purchased at chewy.com or other well-known pet products outlet stores. What all of us can admit as pet parents is that our dogs seem happier when they play with toys that they deem as their favorite. But it doesn’t end there; the toy has to be interactive, keeping them busy and mentally stimulated. A good session of tug of war, for instance, will provide a much-needed workout to those jaw muscles on your dog and support stronger teeth for better health. 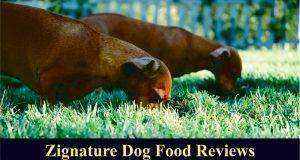 And luckily for you, you’ve just had another chance to learn about some of best tug of war dog toys that can provide that kind of goodness to your dog while giving you an opportunity to bond with her. 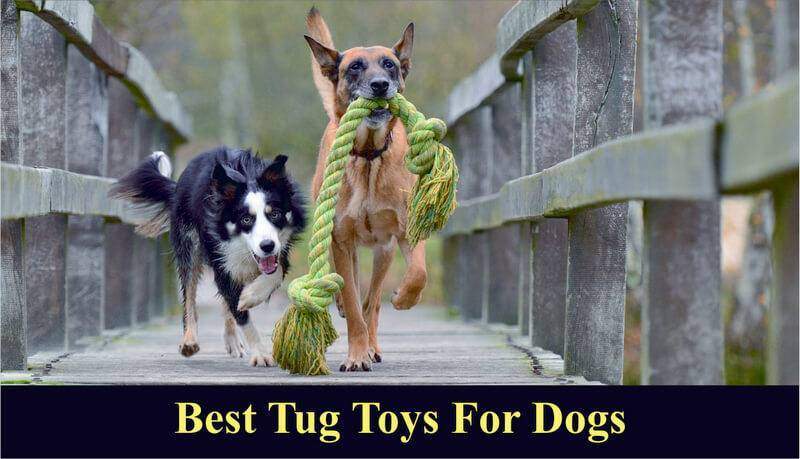 Tug toys need not be complicated nor expensive; they just need to be made from the right materials, such as 100% cotton, for the strongest rope toy for dogs. This ensures that your dog can indulge in some good old tugging while chewing for healthier gums and teeth without you having to buy a new tug toy every week. With the above options, that will be the least of your worries.